I'm going to keep this very brief, because I need to get some sleep for a half-marathon tomorrow. Yes, a half-marathon. This morning, I was trying to think of something to do tonight or tomorrow, because my parents were taking the kids camping, and Jerry was off work. Someone on Facebook mentioned a local 5K, and I thought, "Hey, maybe I'll do a race!" Which then led me to thinking about wanting to do a longer race than a 5K. I searched for half-marathons online, but only found one, which was 4 hours away in northwest Michigan. When it was clear that there weren't any other options, I started to think of the logistics of it. Would it be so crazy to drive up there for it? There was nothing holding us at home, because the kids will be camping until Monday. So I asked Jerry, and while he thought it was crazy, he thought it sounded fun, too. The race had a marathon, half-marathon, and 10K option, as well as a four-person marathon relay. I tried to recruit my brother to do the relay with us, but he had to work, so it was just Jerry and me. Jerry decided to run the 10K, and I chose to do the half-marathon. The race goes around a small inland lake. 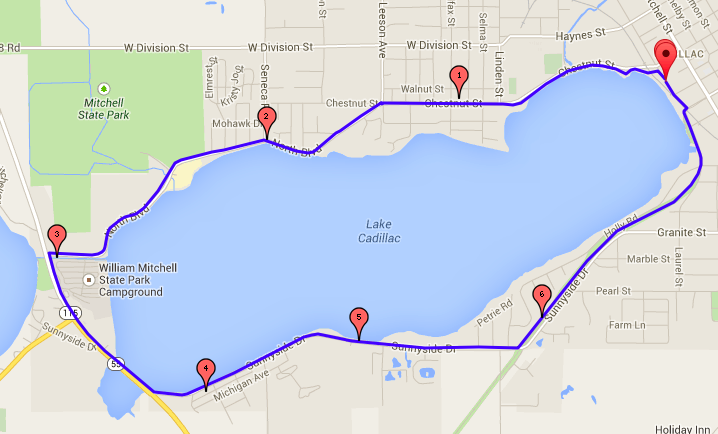 The loop around the lake is just less than 7 miles around, so you do almost two loops for a half-marathon, a little less than one loop for the 10K, and almost four for a marathon. All three races start at the same time, just at different spots at the course, and the finish line is the same for everyone. The field is actually pretty competitive for such a small race. I will likely be in the bottom five finishers overall! Hahaha, I really don't mind, though. The marathon will be going on at the same time, so at least I won't be the last one on the course. But first, we had to drive up there, to Cadillac, Michigan. Jerry came home from work early, so we headed out at 3:15. The first half of the drive was nothing new to me, but once we got up to Bay City area and headed west, it was all new territory. And it was so nice! Jerry and I both kept talking about how pretty it was. We listened to old school music, and had a good time in the car. When we got to Cadillac, I was surprised, to say the least. I don't know what I was picturing, but it was completely different than I expected. It's a super cute town--not much to do/see, but really pretty, clean, and spacious. I was absolutely starving, because it was already 7:00, so we headed down the road to a bar/restaurant called Clam Lake Beer Company (highly recommended by the hotel). Jerry was thrilled with the selection of beer, and I just wanted food. NOW. 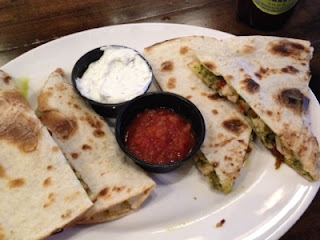 I ordered a pesto chicken quesadilla with sundried tomatoes, and it was really good! Anyway, after dinner, we drove around the course of the race, to check it out. Holy smokes, is it ever GORGEOUS. Photos don't do it justice at all. After seeing the course, I was so happy with the spur-of-the-moment decision to drive up here. It’s SO pretty, and I can’t wait to run on it tomorrow. I am pretty sure it’s going to be my slowest half ever, because I plan to take at least a few dozen photos on the course. I was actually thinking of doing the 10K instead of the half-marathon, because I’d like to run with Jerry. There really isn’t any reason to do the half over the 10K, so we’ll see what I end up registering for in the morning. On one hand, I feel like if I drove all this way, I might as well do the half; but on the other hand, running with Jerry would be more enjoyable, and something we could do together. After the race, we plan to spend the day here before driving home. We were planning to go to Traverse City, but now that we’ve seen Cadillac, we think we’d be just as happy hanging out here. It’s just such a nice little town! If you do head up to Traverse City, check out Oryana Natural Foods Market! It is a great place and Michigan's Largest food co-op! They also have a great cafe! THey havd a cookie called the Good For You Cookie which is really good. I've run around that lake before! I was going to a wedding in Traverse City but forgot to book a room and wasn't able to find a room under 300/night so I ended up staying in Cadillac. The morning after the wedding I ran from my hotel to the paved trail, around the lake and back to my hotel and it was 10 miles, just what I needed for my long run! It was really nice and I saw quite a few others out running. I will never forget when I got back, two men who were sitting outside the hotel smoking cigarettes when I left were back out there smoking again when I came back and asked me if I had really been running all that time, I told them where I went and showed them the mileage on my Garmin (10 miles) and they were just shocked!! Anyway, I hope you have a good race! Can't wait to hear all about it. My husband and his family lived in Cadillac for a while when he was younger. His family now lives in Findlay Ohio, when we visited them last weekend they took us up to Toledo to Maumee Bay. They pointed out Michigan on the other side of Lake Erie and thought "Katie lives somewhere in Michigan, I would love to run with her!" 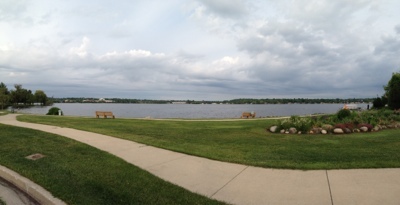 BTW Maumee Bay is quite nice, it would be a great day trip with the kids! I know it'll be a great race, no matter what distance you decide to run. GO KATIE (and Jerry)!!! Spontaneous trips are usually the most fun! Have a great race and enjoy your day with your man! Spontaneous trips are awesome! Yeah for you and your husband running together if that is the way it works out. it look like it will be a beautiful scenic run! Fun adventure! Good luck and enjoy! How fun!!! Can't wait to read about it. what a spontaneously wonderful decision !! I ran a local half marathon last year. There were only 32 participants. I finished 29th and I won my age group (there were even 2 others in my age group). Have fun! DH and I usually don't run together since he is faster than me but we did enjoy running together at a race last year. 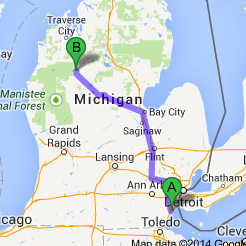 I have only driven through Cadillac but we go to Traverse City every year as my in-laws have a place up there. We love it up there. 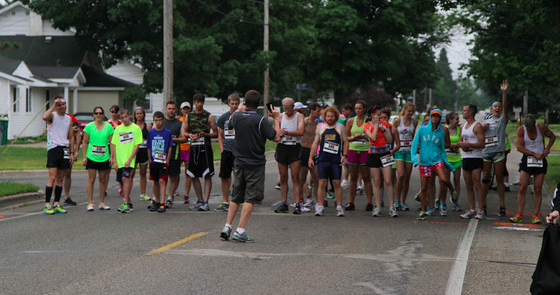 Last time we were there we decided to sign up for a local 5K in Elk Rapids. It was fun running somewhere away from home. This year when we go up in late July/early August we are going to run the 10K. I spent every single one of my summers growing up just south of Cadillac. I love that area! Glad you got to discover it! This is so neat! That you got too do a spur of the moment race with your husband. Love it! !